Cake show season is upon us. Maybe you are entering for the first time. Maybe you’ve been competing for years. Regardless, once you have that scoresheet in your hand, your eyes race to take in the notes from the judges. Did they like it? Did they catch the flaws you didn’t have time to fix? Did they understand your piece? Often, when I visit with a competitor after judging, they don’t understand what makes one cake score better than another. 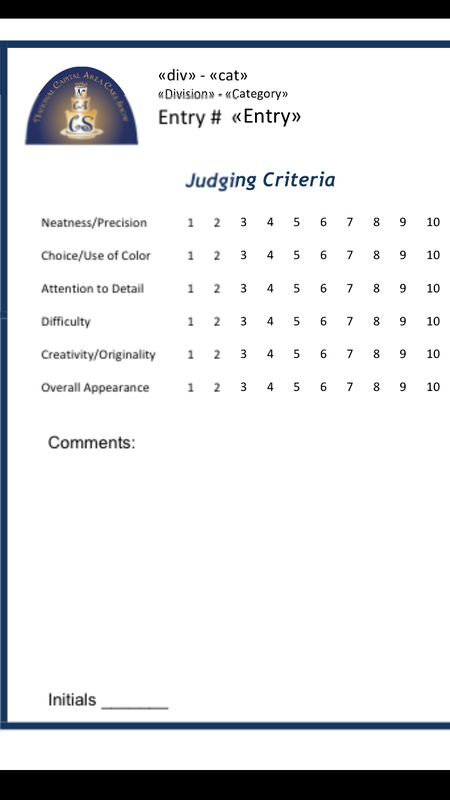 I’ve written before on what judges look for (Here Comes the Judge), but thought it might be helpful if I took a judging sheet and broke down all the categories for you. Jennifer Bartos from That Takes The Cake Show in Austin, Texas and B. Keith Ryder from the National Capital Area Cake Show in Annandale, Virginia were both kind enough to provide me with their show’s judging sheets. This category has us focus on the basics. And, quite frankly, this is where most people quickly lose points. The first thing every cake judge does is look at how well you covered your cake. A fondant cake should not have elephant skin, rips, tears, seams, pock marks or other distress. Fondant should be smooth. The entrants at Cake International in England do this very well. You must take the time to get this part as close to perfect as you can. It sets the stage for all the decorations to come. A rough cake covering will detract from the rest of your work, no matter how nice it might be. But this category is more than just the surface icing. How neatly did you apply your details? Can we see blobs of royal where you attached things? Are there rough edges on your cutouts or flower petals? If you have a design pattern, does it stay uniform? Do your borders stay uniform? To score well in this category, you need to be as neat as possible. Did you recreate a famous cake? Is your piece from a class project? Have you seen this design before? If so, you will suffer on your originality and creativity scores. Most of the cake show judges are well versed in current trends. If you are doing a design that is popular at your bakery or with your brides, chances are that it isn’t very original anymore. To score well here, take an element you like from a cake design, but put your twist on it. Or combine it with unexpected elements. Let’s say you made something as simple as an orchid. If you plop it in a store bought vase, it isn’t very creative. If you put it with tropical items that you make out of sugar, it becomes more creative and original. I know people say that there is nothing new in cake decorating, and maybe that is true, but I still see refreshing spins on designs all the time. This is when you need to design from the heart. Don’t copy; be inspired. For this category, we take into consideration your decorating level. If you are a Beginner, you do not have to meet as high a skill level as a Master. Why don’t we take that into consideration on the two prior categories? Because EVERYONE can be neat. EVERYONE can be creative. In this category, we start looking at the techniques you used to create your cake. Taking an orchid as the example again, we will want the shape to be right regardless of your level. A Beginner will often have thicker petals and will be less adept at dusting the flower. We cut them slack. If you are a Master making that same orchid, we will want to see something more botanically correct. And this applies to all techniques. For piping, Beginners get to use larger tip sizes than would be ok for a Master. As your skill increases, you can move to the smaller tips. In the end, this is a judgement call by the judges as to whether they think your decorating skills fit the level you entered. Sometimes the skills fall short. Sometimes they surpass a person’s level. The bottom rule here is: if you choose a technique, do it as well as you can on a competition piece. We aren’t here to tell you that your pink cake should have been purple. Although, I’ve heard that judges in England sometimes do make such comments. Our role as judges is not to redesign your cake, but to judge it based upon what you presented. If you choose a design for a college team, for example, and their colors are burnt orange and black, you need to use those colors. If you use a bright orange instead, we would mark you down on your use of color. You didn’t stay true to your design. More often, color issues are more tricky. The color faded as you worked on the cake and we can tell. You chose colors that clash instead of complimenting each other. You have one spot of color that doesn’t fit your design at all and almost looks like a mistake or an afterthought (or a leftover flower used in an emergency). I have a friend who has trouble with colors on the pink/red spectrum. She kept getting notes that her colors didn’t work. She finally figured out that she was a little color blind and got advice as she worked on the cake to make sure her colors looked right together. It is possible to use too many colors, also. I judged a beautiful piece of royal icing piping once…it was maybe 4″ in diameter, but had at least a dozen colors. Even that would not have been a problem, but the colors were randomly placed, so that it looked like they used up every bag they had to complete the piece. There wasn’t an art or design to the numerous colors. 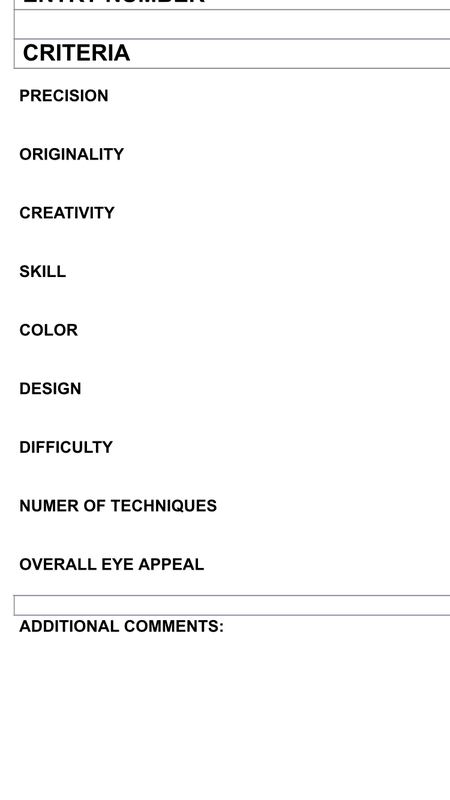 Some entrants feel that judges are biased for or against certain colors, but I’ve never found that to be true. If you are doing a dark or horror piece, dark colors and gore are appropriate. If you are doing a sweet baby shower cake, we will expect most of them to be in pastels, but that doesn’t preclude a brightly themed design for a baby shower. Let your design guide you and use the colors that enhance it the most. Not all techniques are created equally. Some things are, quite frankly, harder to create. You don’t lose points for doing an easy design, but you sure don’t gain any, either. What are the harder techniques? I always tell folks to go to the ICES.ORG website and look up the rules for becoming an ICES Certified Master Sugar Artist. There, they outline the most recognized techniques and rank them from level one to level four. Level three and four techniques are the more time consuming and exacting ones. These take skill and practice to master. If there were two cakes that were equal on all other merits, but one used more difficult techniques, it would usually place higher than the one with the easier techniques. This does NOT mean you have to throw extension work or Lambeth on your cake in order to win. In fact, you should never use a difficult technique unless you can do it justice. Poorly piped Lambeth will not out score a cake with easier techniques if that cake is done at a higher skill level. Please also keep in mind that the higher your level, the more difficult we expect your techniques to be. A Master should be able to execute something more challenging. That doesn’t mean that a Master can’t do an easy technique, but they should probably do it nearly perfectly! Please don’t throw in a hard technique just to get more points. If you attempt extension work, and do it very poorly, the fact that it is difficult will not work to your benefit. The real key to cake show competitions is to do the most difficult techniques at which you excel. Show off your best. Oh, the problems this category has created. So many newer competitors read this as a challenge to throw everything they know onto a cake. Yes, we would love to see more than one technique, most times, but let your cake design be the guide! Do not throw things together that don’t go with the design. If you do that, your cake can start to look like a jumbled mess. Many times, we will run into two cakes that are pretty equal in terms of their decorating skill and execution. At this point, judges often consider the number of techniques as a tie breaker…or at least I do. If someone has done a great job and done three things, that should count for more than someone who did an equally great job, but only did one technique. Make sense? The one who did more techniques had to excel in three different categories. Is there a magic number for how many techniques you should include? Not at all. Again, the cake design should determine what is right. And let me be very clear: if you just do one technique and do it nearly perfectly, that will out score a cake with several techniques that is poorly executed. Do not throw the kitchen sink on your cake. This is not the time to show us everything you know how to do. It is the time to show us what you know how to do WELL. I’m sure you’ve been scrolling through your Facebook feed when a cake stops you in your tracks. It grabs your attention and makes you go in for a closer look. Some cakes truly have that magic. Those always score high in overall appearance. Sometimes you will see a cake that just seems “off” somehow. Maybe the background distracts. Maybe the sizes don’t work together or the colors clash. Those cakes will score lower on eye appeal. This is obviously a very subjective category, but if I put a group of ten decorators in a room, they almost always gravitate to the same eye pleasing cake. I wish I could explain it better, but here is my suggestion. See your cake as a full page in a magazine. Does your design and your work grab you so much that you would want to see close ups of the cake on the following pages? If so, you have probably got eye appeal in your favor. I read an article from a friend who said that every cake starts as a Gold in England. In the US, you could say you start with a perfect score. You only lose points if you don’t execute to the standards of your level as a decorator. Some judges think that everyone starts as average and get marked up or down for work that is above or below average. Whichever judge you encounter, remember that they judged every cake in the exact same manner. Remember that the judges are not trying to hurt your feelings! They have a job to do. Sometimes the money and prizes are of such value that they have to be extra strict. None of this is personal. You should take it as an indicator of where your skills are and a challenge to improve on those items that are lacking. Every time I worked on one of my weaknesses, I became a stronger, better decorator. Best of luck at your upcoming cake shows! Enjoy your design. Make the cake for yourself and to share your gift. Bring beauty to the world. You’re always a wealth of information! Fantastic explanation! This should be required reading for everyone who enters competitions. Icing skill . I stopped entering cake at the show …. That is a shame. I’ve also written on what makes a good judge. I know not all are.